Lemongrass has the amazing ability to tame the "gamy" flavor of lamb. In this Vietnamese recipe, lemongrass is finely chopped and combined with fish sauce and sweet mushroom sauce to give a robust flavor to the lamb chops. The chops need to marinate overnight, but then you can sear and bake them, as this recipe calls for, or pan-fry or barbecue them. In a medium bowl, combine minced lemon grass, chili peppers, garlic, black pepper, salt, sugar, fish sauce, lemon juice and soy sauce and stir until well mixed. Place lemon grass marinade in a large shallow pan. Add lamb chops individually, spooning marinade all over the meat to ensure each chop is well coated. Cover with plastic wrap and refrigerate for 3 hours or up to 24 hours. To make the dipping sauce, in a saucepan combine 1 cup water, garlic, and brown sugar and bring to a boil over medium-high heat. Reduce the heat to medium-low, constantly stirring for 1 minute until sugar melts, then turn off the heat. About 30 minutes before cooking, remove lamb chops from the refrigerator. Preheat the oven to 400 F.
Heat the canola oil in a large skillet over high heat. Let the marinade drip off the lamb chops, then add them to the skillet. Brown one side of the chops for 2 minutes. Turn lamb over and brown for another 2 minutes. Transfer the skillet to the oven and bake for 5 to 10 minutes, or until cooked medium rare. Take the skillet out of the oven, and transfer the chops to a serving plate. Set aside. Pour the marinade into a small saucepan and bring to a gentle boil on medium-high. Reduce the heat to low and simmer for 5 minutes. Pour the reduced marinade into a serving bowl. Place cucumbers, tomatoes, and cilantro in individual serving bowls. 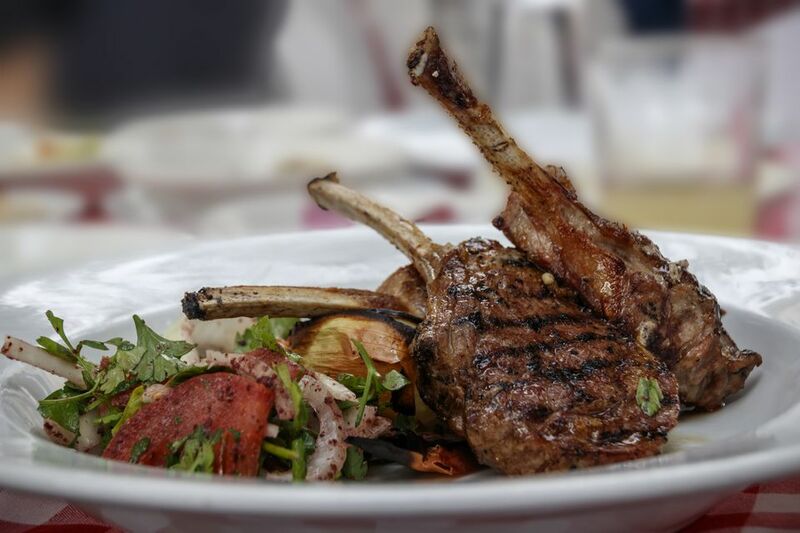 Serve the lamb chops, family-style, with the marinade, dipping sauce, cucumbers, tomatoes and cilantro as condiments. From East Meets West: Traditional and Contemporary Asian Dishes from Acclaimed Vancouver Restaurants © 2012 by Stephanie Yuen. Reprinted with permission of Douglas & McIntyre, an imprint of D&M Publishers. Make the Tastiest Sambal Fried Rice at Home!